Due to the constant burglary faced by so many celebrities, some has taken to some drastic measures and that means hiring full-time able-bodied security to protect her new engagement ring given to her by her fiance, Chris Xylia who recently proposed to her. Paris Whitney Hilton is an American businesswoman, socialite, model, actress, DJ, television and media personality born February 17, 1981. How do we get to know of this new trend? 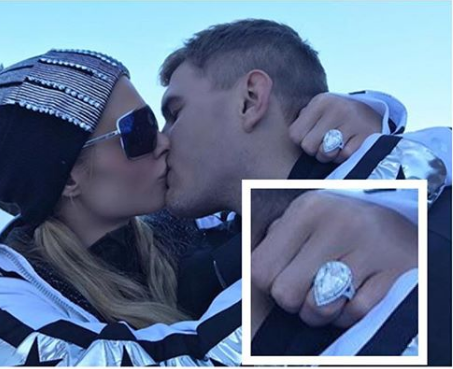 Well sources close to the heiress say that Paris and her fiance, Chris Zylka, have had 24/7 security with them ever since he put a ring on her finger a week ago. What's her reasons for doing so? Paris feels it's necessary to have someone protecting them at all times due to the high amount of celebrity burglaries in the past year. Paris’ ring security are always with her at all times but they dress in street clothes to be more discreet. What do you think about this new trend? Is it right or she's just doing too much? Let's hear your thoughts on this.